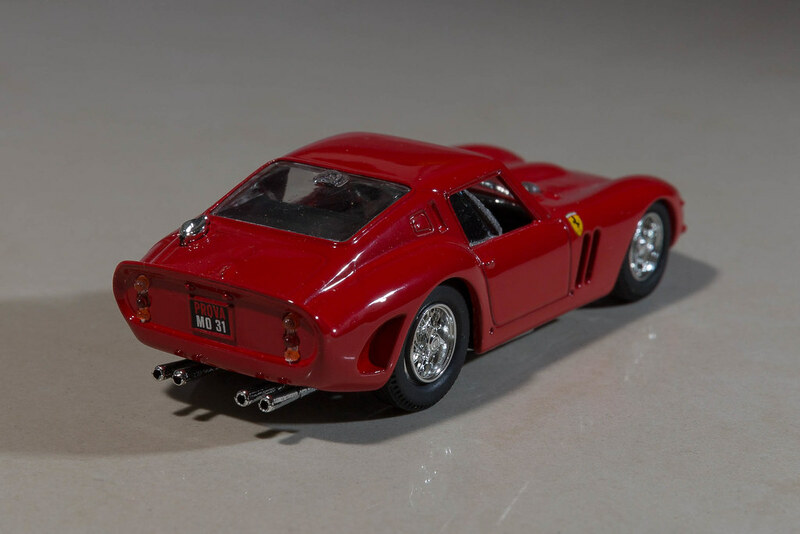 As others have I thought I'd start a thread about my collection of 1:43 die-cast models. What I want to try and do is showcase some models, or groups of models, with an explanation of why I bought that model. 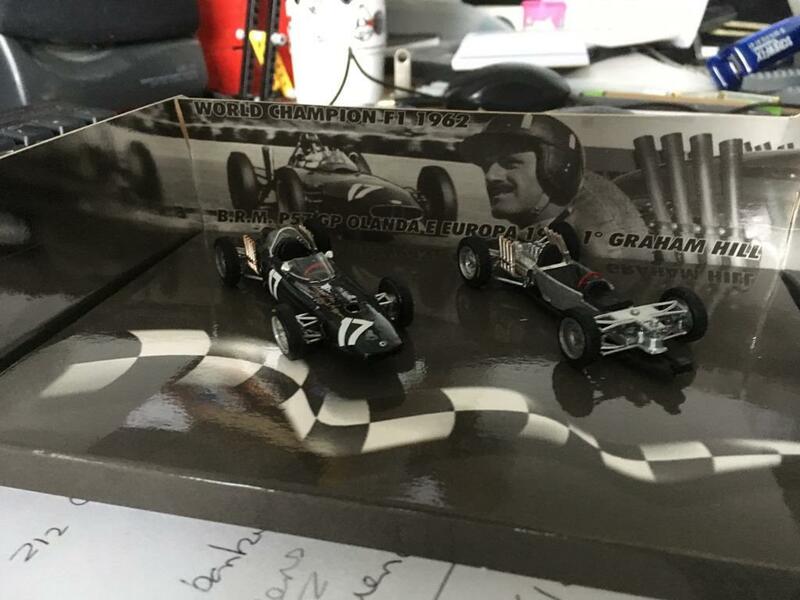 To start with my most recent buy, a Brumm twin set of Graham Hill's 1962 BRM stack-pipe P57 chassis and car (£20 eBay buy). I've already got the separate Brumm models of the P57 but couldn't resist this set with the separate chassis. Graham Hill is a particular 'hero' of mine (along with Tony Pond and Derek Bell) very under rated and under the shadow of Jim Clark and Jackie Stewart but 2 F1 Championships, a Le Mans win and an Indy 500 win can't be too bad not to mention the Monaco wins. Yet it never seems to get mentioned when every body talks about Alonso going for the golden crown. 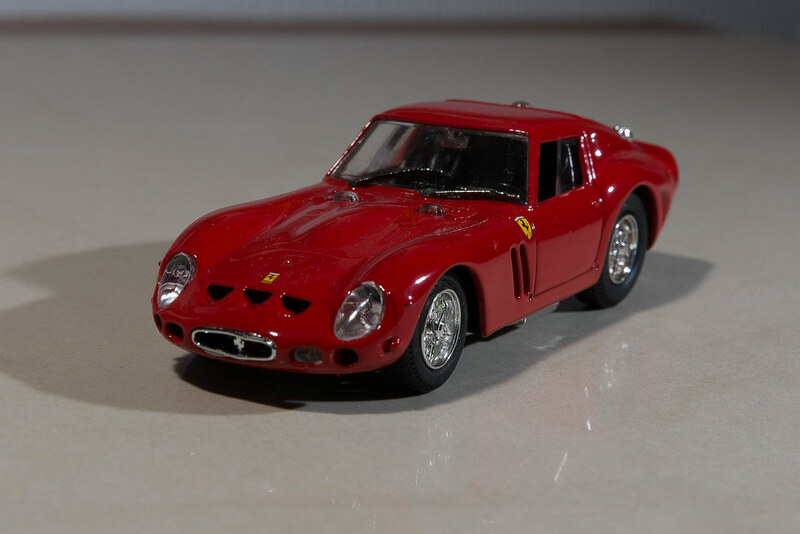 They also do a John Surtees Ferrari 158 as a twin set. This is a phone picture, future images will be taken with a proper camera, I'm going to build some dioramas/backgrounds for the cars. 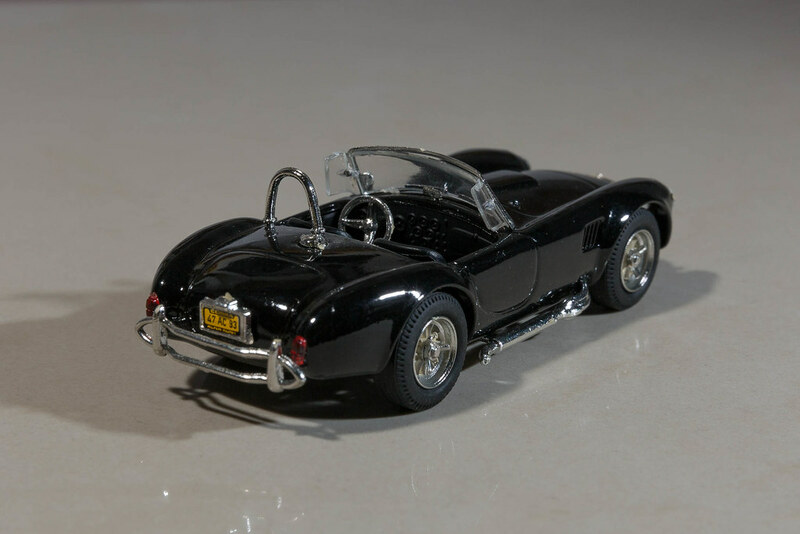 I'm looking for some 1:43 (O gauge) figures as well that are realistic and not too expensive ready painted. To start off, a model I bought quite early on in my collecting. 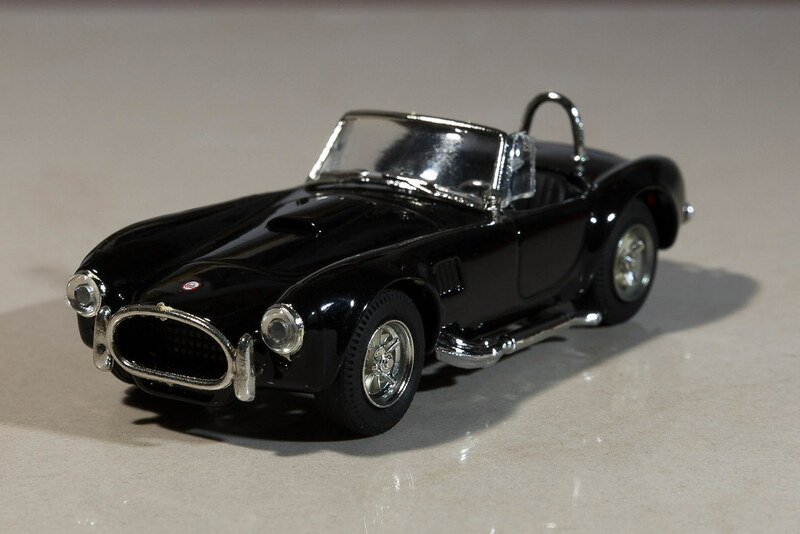 No real reason why except I really like Cobra's (doesn't everybody?). 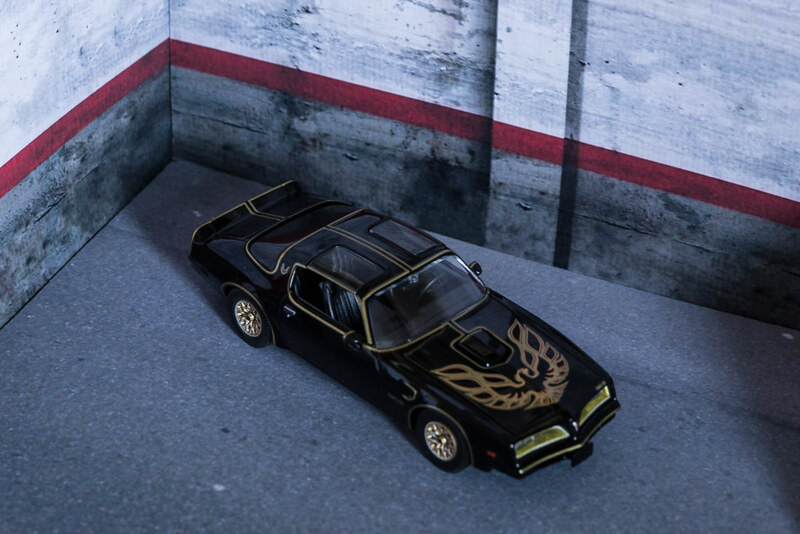 It's a Box model and probably didn't cost that much, I think the detailing is pretty good particularly given how old it is. I particularly like the wheels and the license plate. These days the dash would probably be printed and the chrome is a bit OTT. I have a few Box models in my collection as they were good value, and there wasn't much to choose from back then. 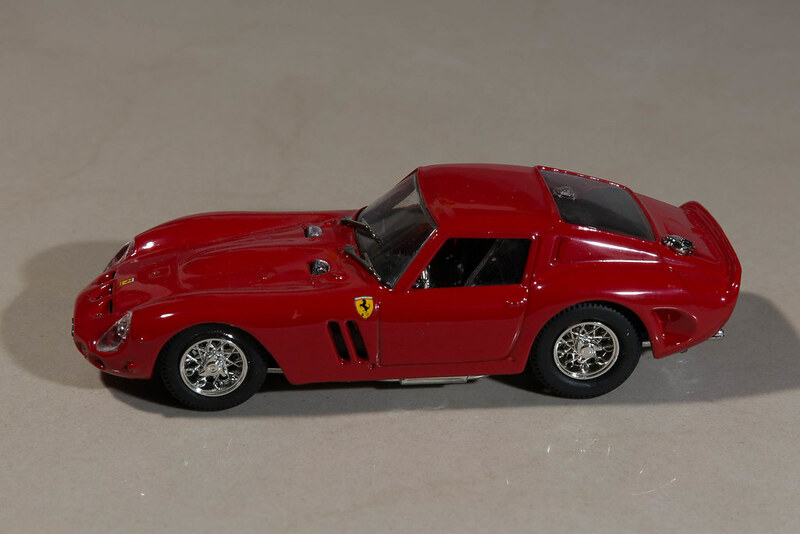 Another is the Ferrari 250GTO, a nice counterpoint to the Cobra. This on is let down by the wheels, which on a more recent model would be much better, and the chrome is a bit too bright. But the overall shape etc is very good, complete with Italian number plate. 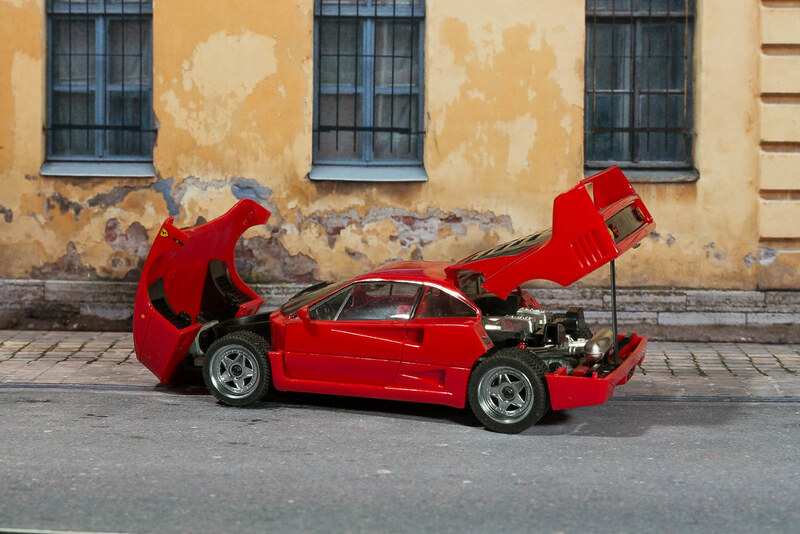 I suppose I could swap the wheels out for some after-market wire wheels. Using a DSLR with two flash guns still need to work on placement. 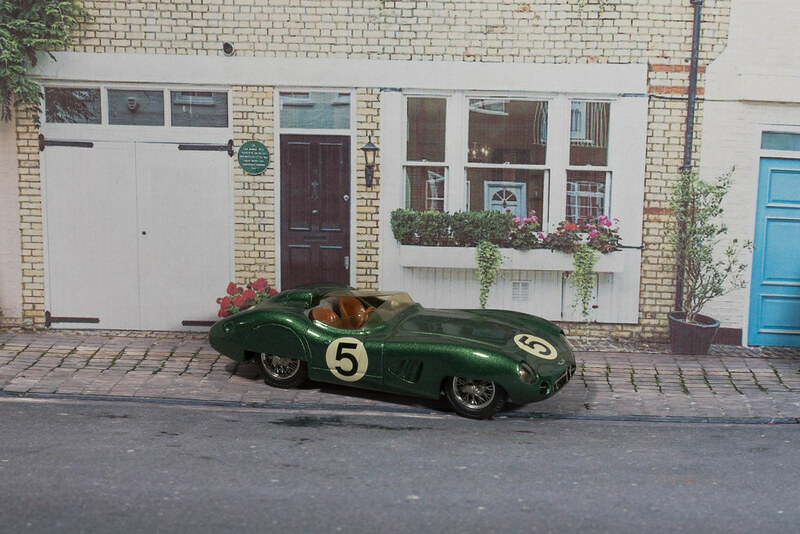 This is a bit of an experiment in creating a simple diorama, the wall is from Model Railway Scenery and is printed sheet on cardboard, the backdrop is from an old Model Railway magazine, both O gauge and the road is some wet-and-dry. 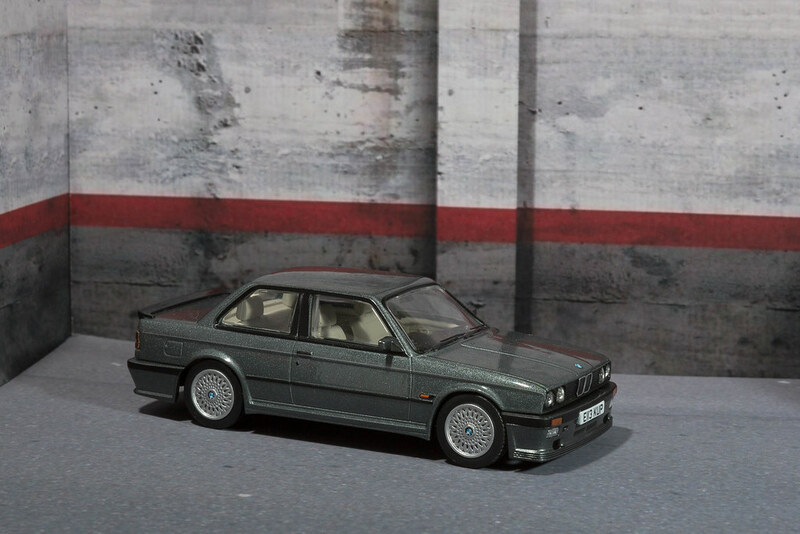 The model is a Corgi Vanguard Minichamps BMW E30 M3 (yes I should have sorted out the number plate and dusted it), Great models for the price, the wheels particularly are a good representation. 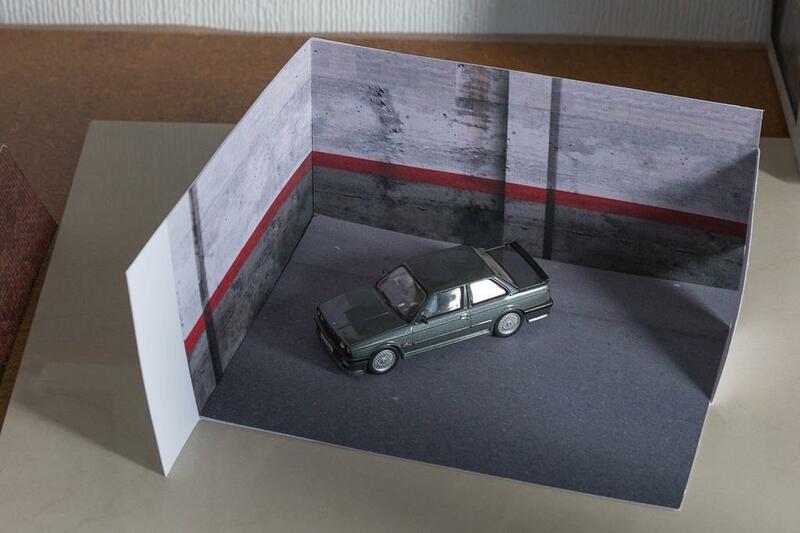 I think the diorama works well, need to sort out the lighting to reduce glare and make the 'road' more realistic. The wet and dry road is inspired! Nice idea for using O gauge stuff, what scale is o gauge? Nice BMW too, the wheels look very good. 'O' gauge is 1:43.5 close enough for me (OO is 1:76) there are a lot of card kits, buildings etc out there for OO gauge, not as much as for O. The wet and dry was a tip I read many years ago and have always remembered, could do with being lighter and having some weathering. I'm going to try some low relief buildings next. 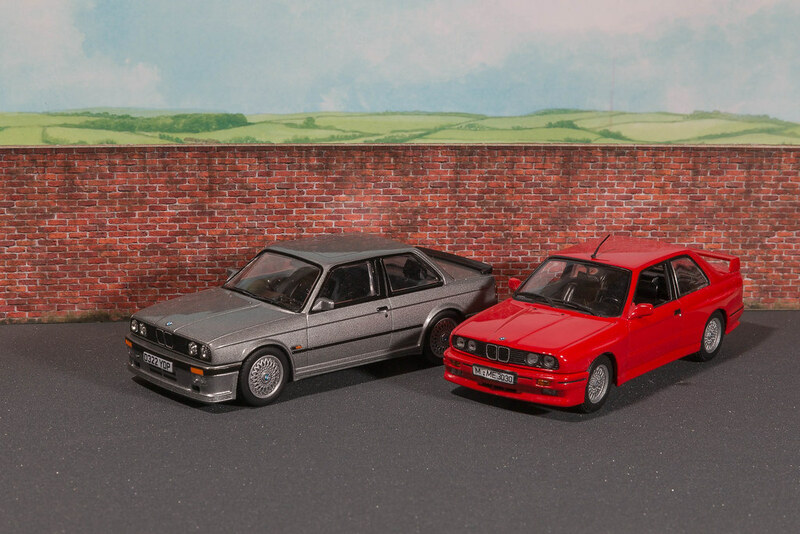 Added a Corgi Vanguard, BMW E30 325i Sport as a comparison to the M3. 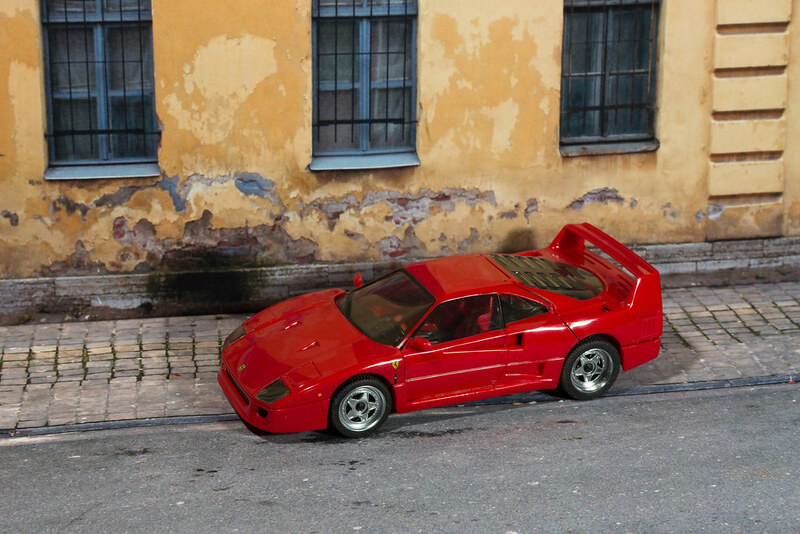 I had one of these spent loads on it, only drove it a few times then lost loads when I sold it! 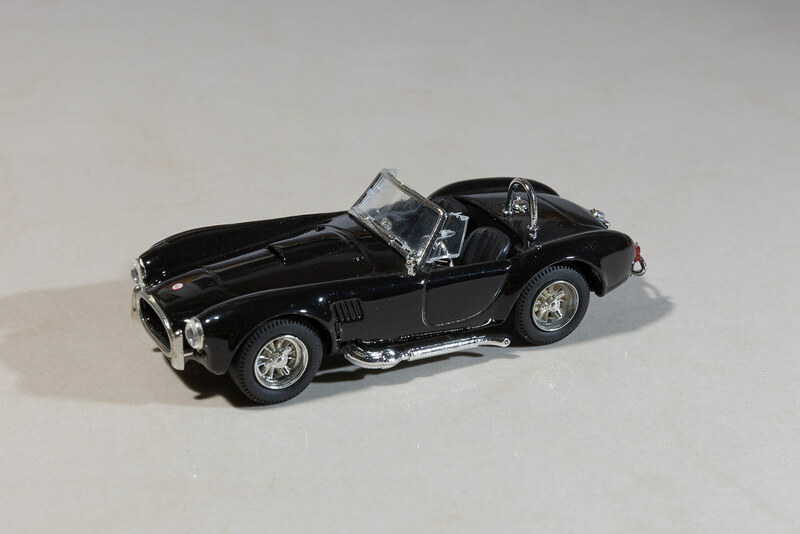 The model is a limited edition, 1 of 2,000 so will be worth a mint (not). Wheels not as good as the M3 but not a bad model for the price. Put a diffuser on the right hand flash which has reduced some of the glare on the background. 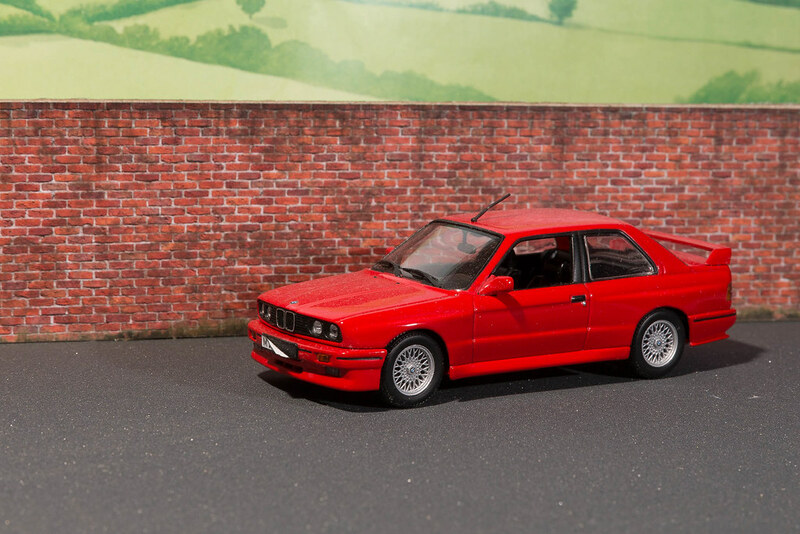 A correction the M3 model is a Minichamps model, no wonder the wheels are better than the Corgi version. 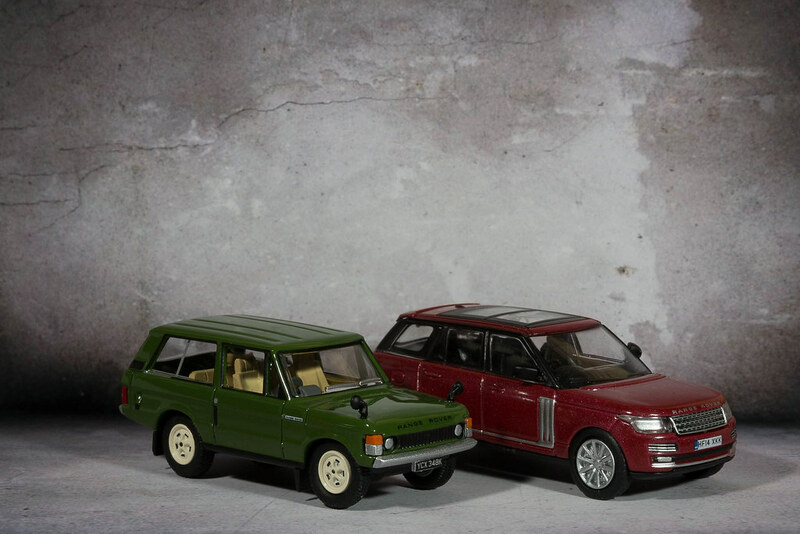 Mine was an E reg (as is the model) but had chrome bumpers. 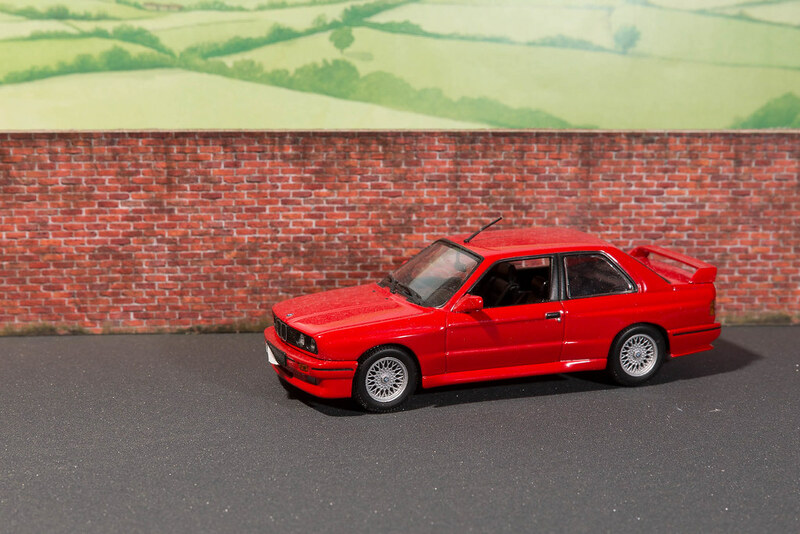 The model has the M-tech 1 body kit. 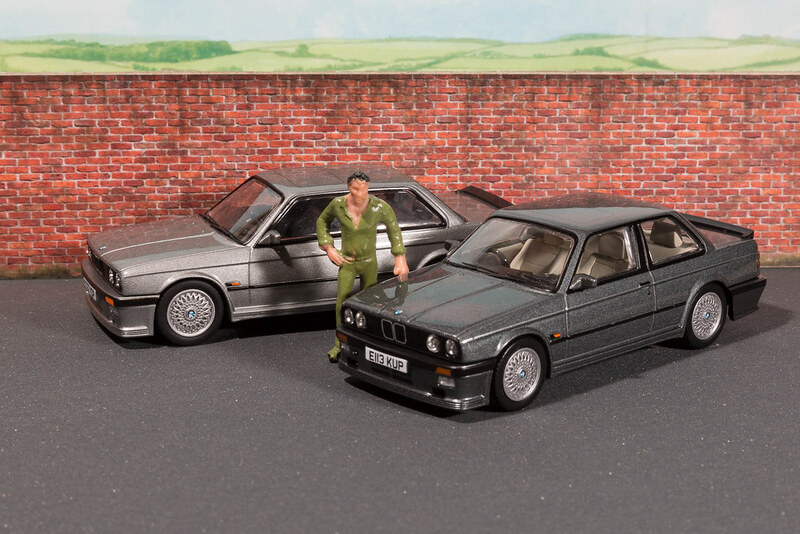 I wonder if I can fit the black interior from the silver car and the wheels from the Minichamps M3. 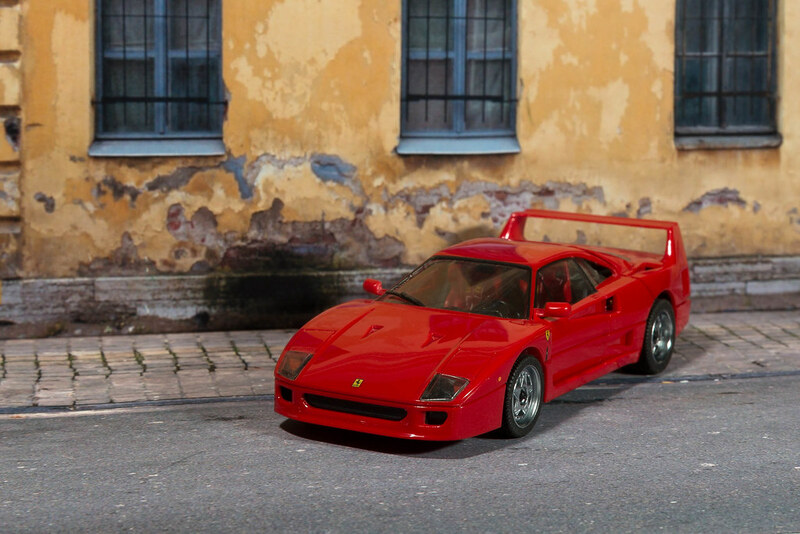 So who doesn't like the Ferrari F40! 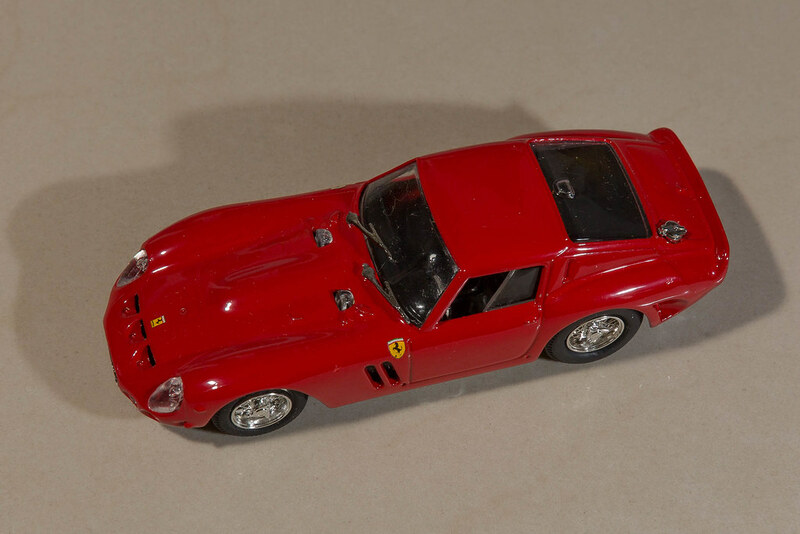 This breaks the rules a bit as although it's 1:43 it isn't die-cast but plastic. The model is by Herpa and is amazingly detailed, I bought it at Frankfurt airport a long time ago for DM53.25 (pre euro). Background is thanks to a pointer by Anglia68 and is from www.modelalice.com/ It was ordered as 1:43 scale but looks a bit big to me (unless the model is under-scale). It's more suited to something French anyway. A bit of a change of direction. 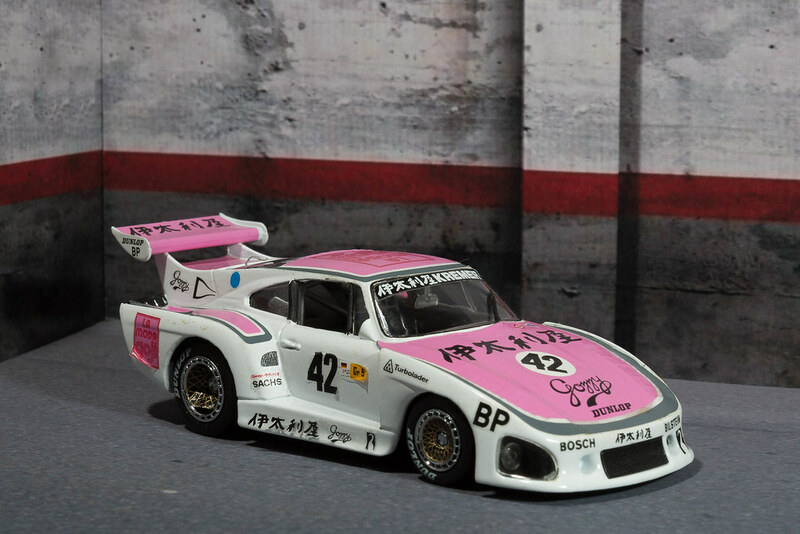 The car is a Porsche Kremer K3 "Gozzi Kremer" which was based on the factory Porsche 935/78, this chassis started out as a 930 chassis. This is actually classed as road based, there's a normal 911 rear screen below the actual rear screen to 'keep to the rules'. Twin turbo 740-800bhp. 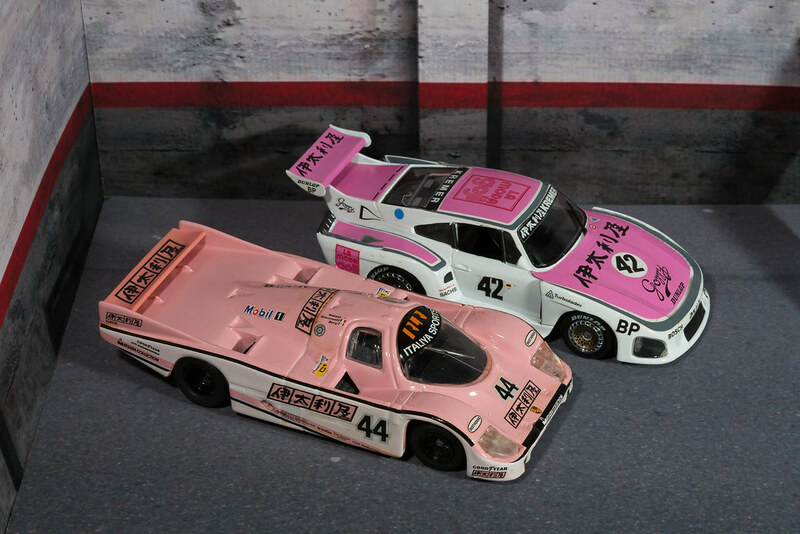 Raced at Le Mans in 1980, (Tetsu Ikuzawa, Rolf Stommelen, Axel Plankenhorn), DNF. The model is by Quartzo (3002). Nice backgrounds. 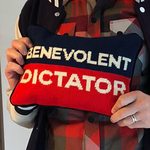 Just ordered a couple. Thanks for the tip. Don't thank me thank Anglia68 that's where I got the tip. Delivery is a bit long but the quality is good, which one(s) have you ordered? I might go back and order the graffiti one. I have taken high resolution scans of the backgrounds so I could produce them at different scales if I wanted to. More images to come based on french cars this time. 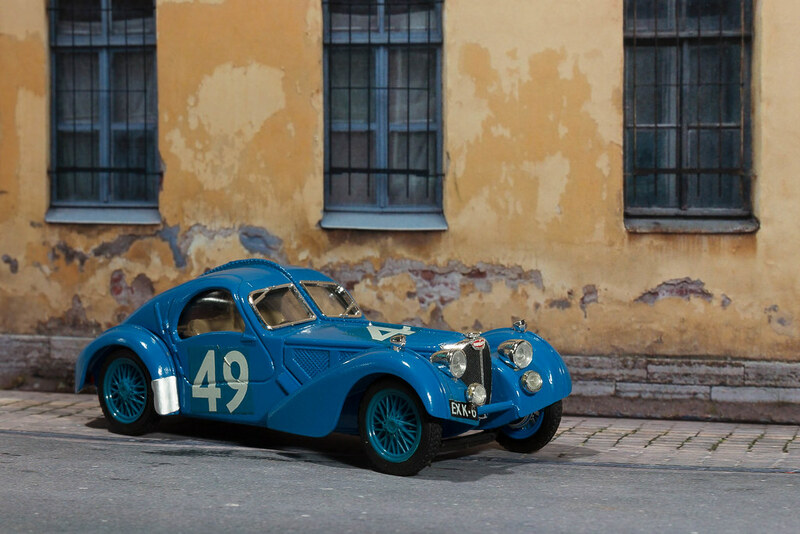 As the background with the wall and windows looked French to me I thought some French cars would be appropriate and you can't get much more French than pre-war Bugatti's. 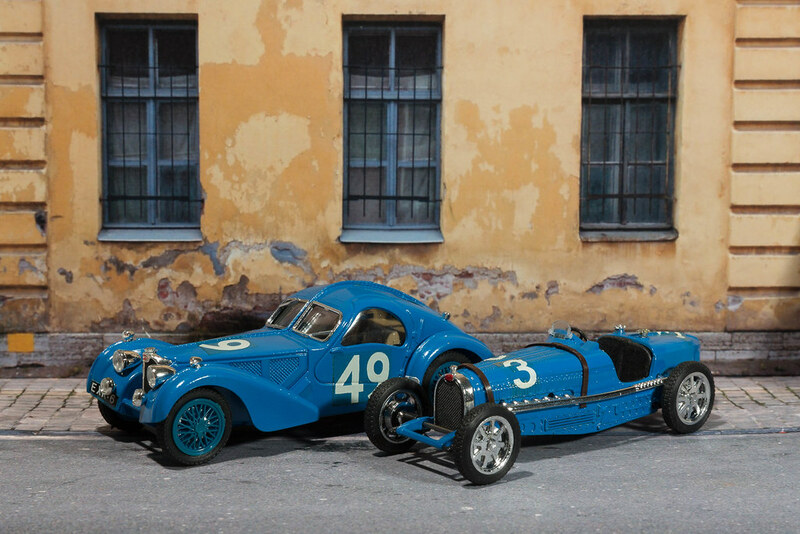 For me the best Buggati's are the T59 and T57, yes the Royale's are impressive but for sheer class the T57 can't be beaten and as for the T59 it's the archetypal pre-war race car. 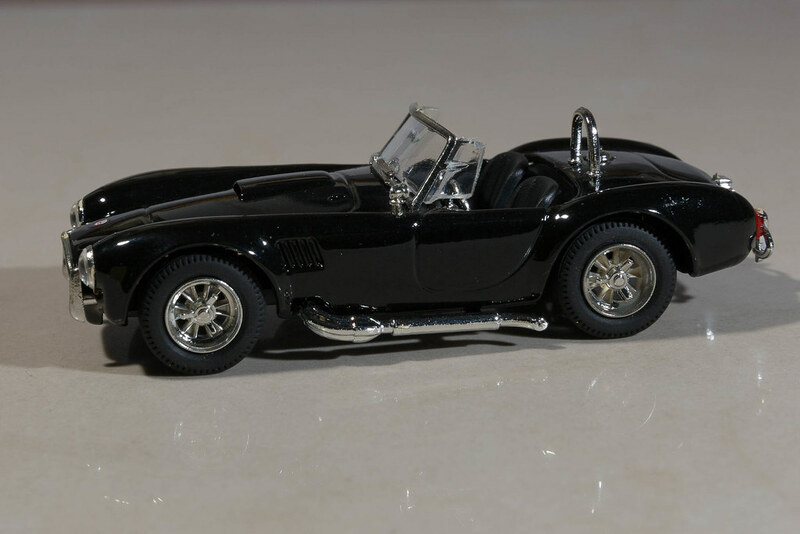 These are Brumm models so a bit simplistic and the chrome is overdone, I guess I could give the chrome a wash with satin varnish or similar. Now for a WIP experiment. 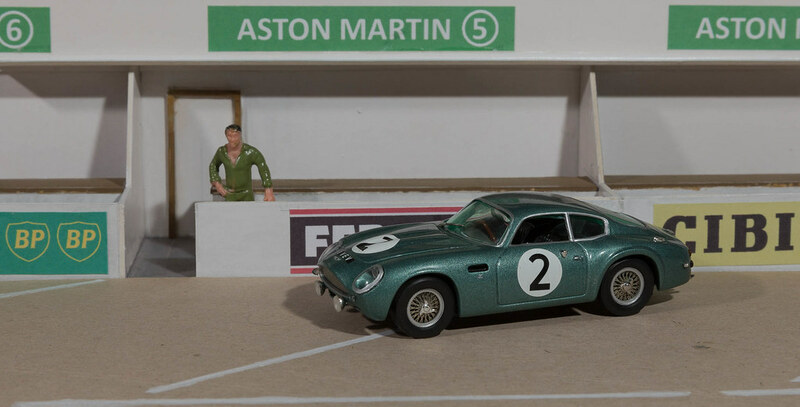 I was looking for images of mews houses as a basis of a potential diorama model when I came across an image of the birth place of Aston Martin that was pretty much a straight on view. 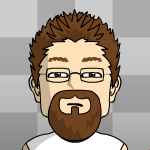 Download, scale to 1:43, print and another background. This is printed on plain paper and the transition to the base (from the 'French' background) isn't brilliant. I'll try again with a print on photo paper. 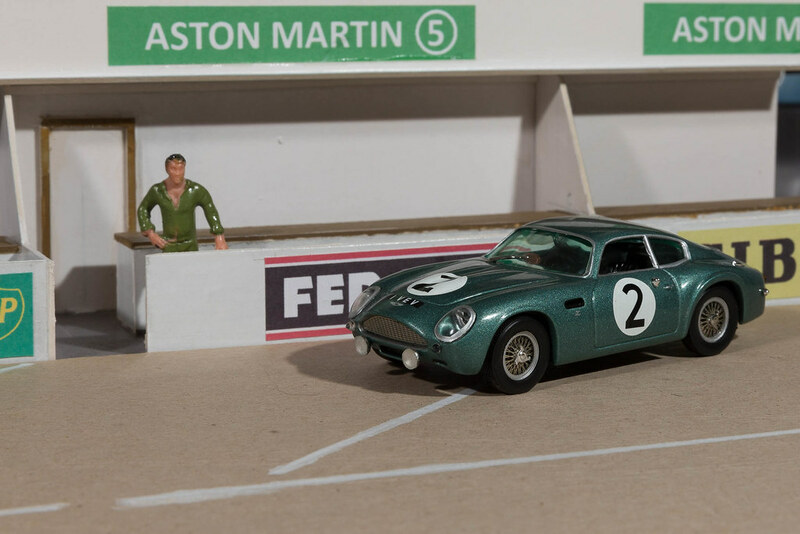 Oh the model is a western Models Aston Martin DBR1/300 Le Mans winner 1959. 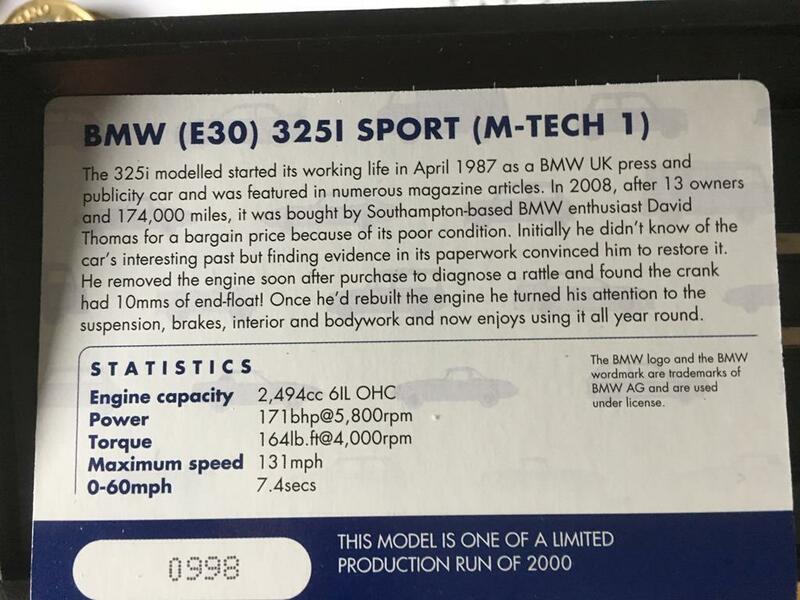 The most expensive model I've bought (at the time, £45.50) it's a hand built die-cast and is notably heavier than other models. 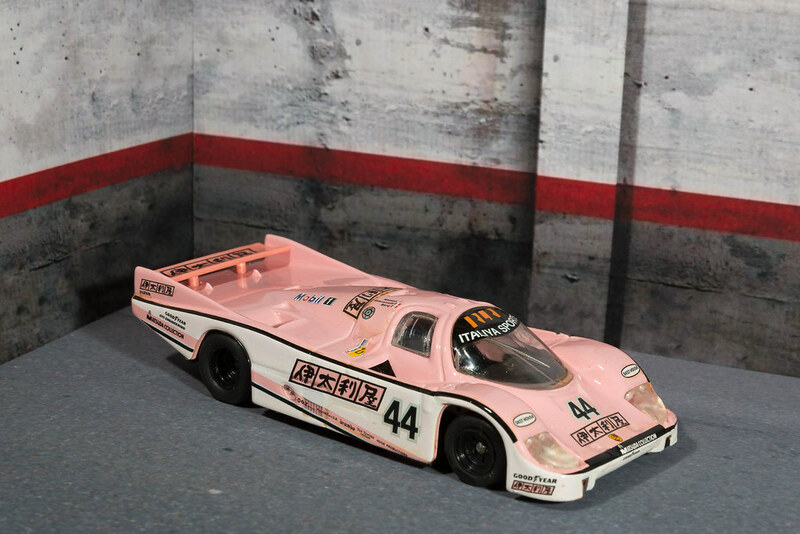 First that other pink Porsche I mentioned, Porsche 962C from Le Mans 1990. Anybody got some recommendation on how to reattach decals? some have fallen off the 935. 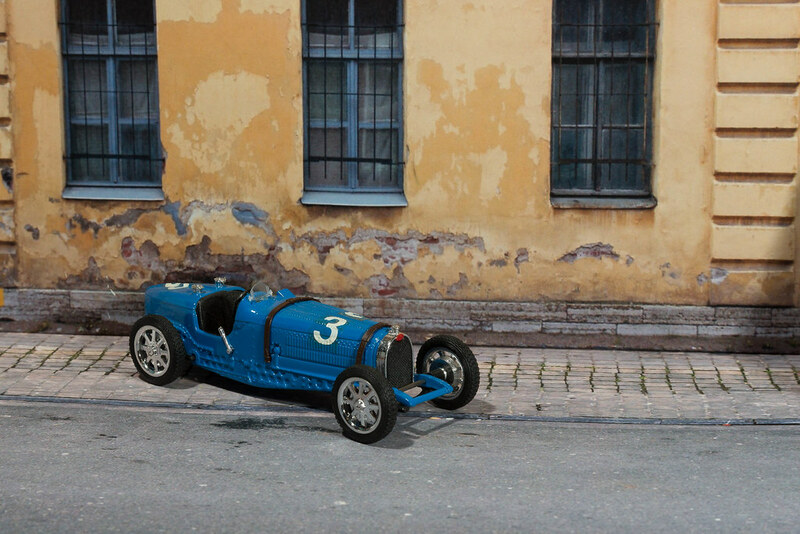 And back to 1:76, this is another 'modelalice' background, a bit small for the 1:43 models. 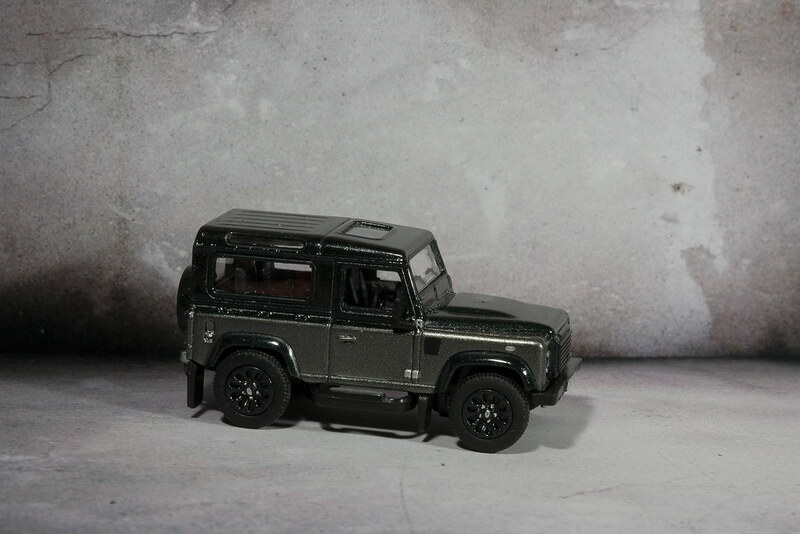 Not sure this is the best background for these models as the images are a bit dark. 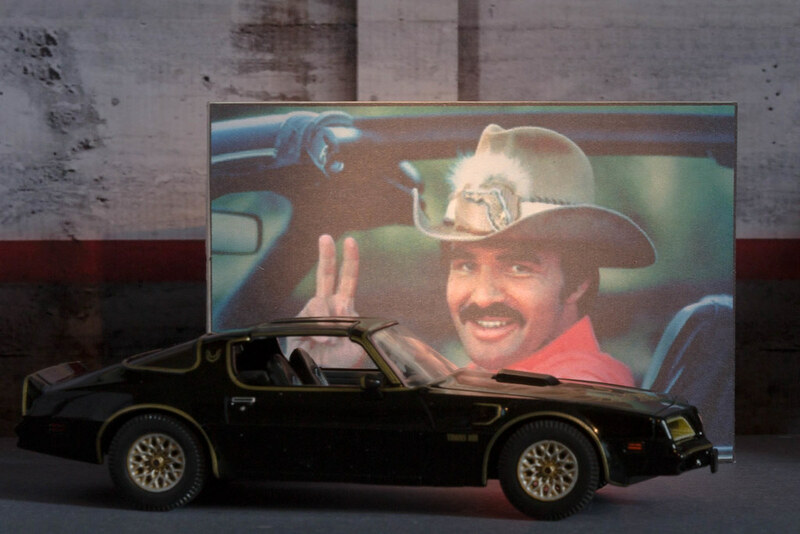 "...Even Burt Reynolds in that black trans-am..."
from the lyrics of Cadillac Ranch by Bruce Springsteen. 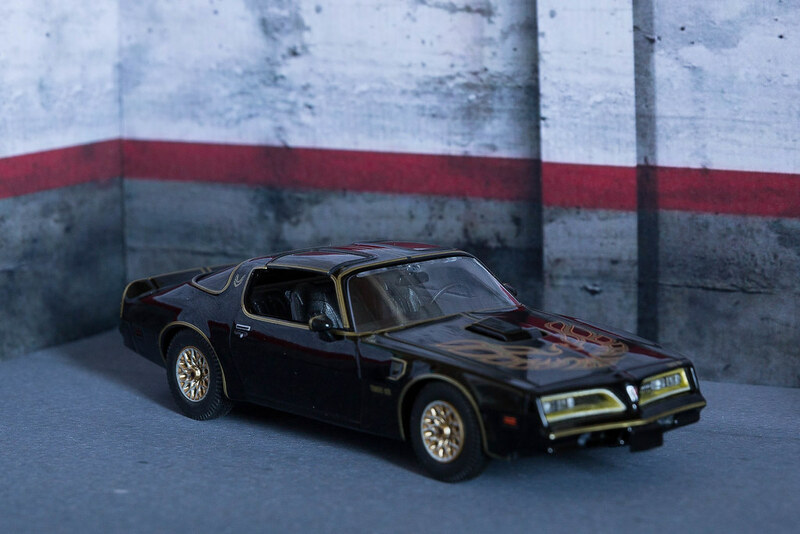 Long and dark, shiny and black ..."
Finding a model Cadillac Eldorado that isn't pink might be difficult, did find this one. 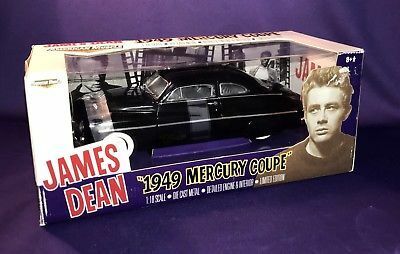 "...James Dean in that Mercury '49..."
You can get a model of this but only from the US so not cheap. 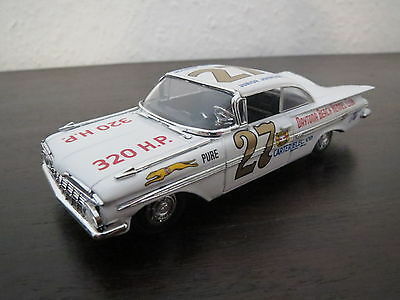 "...Junior Johnson runnin' thru the woods of Caroline..."
Would make a nice 4 car display though. Something I've been meaning to do for a long time, build a diorama to display the models in. 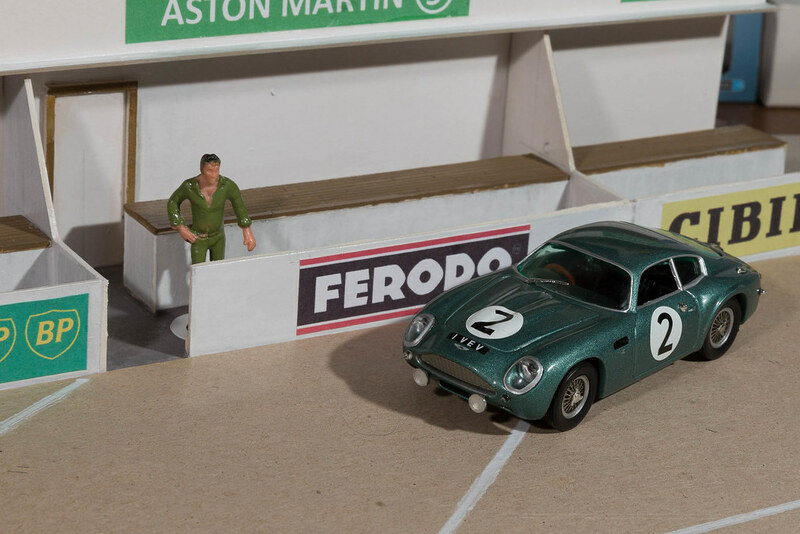 This is 'inspired' by 50's/60's Le Mans pits, very simply made from card mount. I need some more figures and other accessories, all the pictures you see of the Le Mans pits show them crowded with people. This one suffers from too much clutter in the background, should have made it wider (or positioned the car more to the left).